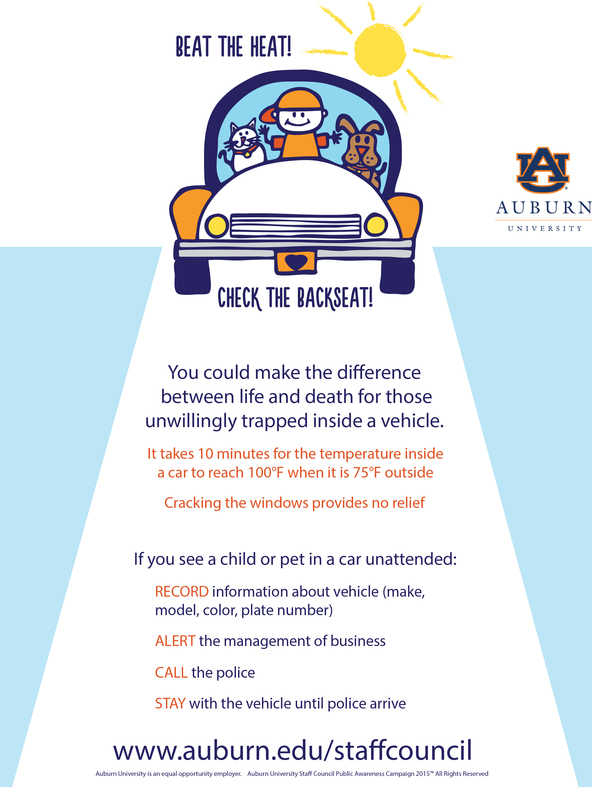 A new community service campaign to inform the public about the dangers of heat-related issues has been launched by the Auburn University Staff Council. “Beat the Heat, Check the Back Seat” is the brainchild of College of Veterinary Medicine employees Hollie Lee and Sharron Barney, who serve on the Auburn University Staff Council’s Health and Wellness Committee. Through their work, and members of AU’s Staff Council, the group has gotten support of university and community officials and received a small grant from the AU Concessions Board. They have launched a Facebook Page, “Beat the Heat Check the Backseat”, and have printed vehicle decals to remind people of the serious issue. The decals can be picked up for free at the Auburn University Bookstore and the chambers of commerce in Auburn and Opelika. You can support this community service effort by giving so additional decals and promotional signs can be purchased to give away. Make a donation to the Auburn University Foundation, and designate “Staff Council Educational Campaign” in the memo line. Mail your gift to the: Auburn University Foundation (AUF), Office of Development, College of Veterinary Medicine, 317 S. College Street, Auburn, AL 36849-5517. “The purpose is to save lives of children and animals, which are especially vulnerable in overheating vehicles,” said Lee, who was moved by an incident she witnessed. Lee said the idea started following a trip to a local business, where she witnessed a dog, who was locked inside a car, in distress. “While the windows of the car was cracked, you could tell the dog was in distress, and there was no one around,” she said. “I went inside the business but I also called the police. But the incident got Lee to thinking about what could happen, and she and Barney started brainstorming what they could do, and got the AU Staff Council interested in taking action. The council enlisted the support of the AU Office of Public Safety and Security as well as Lee County Sheriff Jay Jones. “We want to tell the Auburn University family and ask for their help to tell the community and public,” Lee said. They caution, however, to not take matters into your own hand. “Safe bystander intervention is what we are recommending,” Lee added.